Pavel Parkhomenko’s new film, “Gagarin: First in Space,” went out on general release in Russia on June 7. 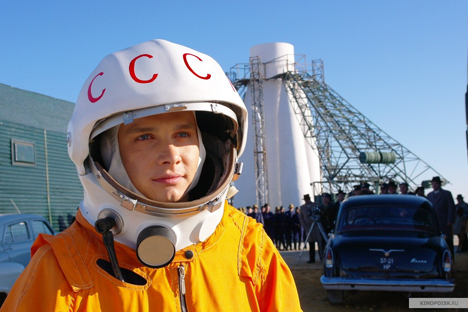 Izvestia talks to 27-year-old actor Yarslav Zhalnin, who plays the part of the legendary cosmonaut. Izvestia: How did you get the role? Were you spotted from your work on TV? Yarslav Zhalnin: The director and producer had never heard of me, but I kept getting callbacks from the casting director. They tried different makeup and costumes on me, and had me read with different partners. It’s not like it was my first experience with auditioning, but they kind of gave you free reign here to improvise and play around with your own ideas. The task was clear: I had to portray a real hero who, at the same time, was an ordinary Russian guy; I had to create a very human image of the world’s first cosmonaut. It was very difficult. Izvestia: Did they tell you that you look like Gagarin? Y.Z. : When they invited me to the auditions, I did an Internet search and found some photographs of him. I was surprised — I didn’t look like him at all. Well, except for the wide smile that I got from my mother. Gagarin was a good four inches shorter than me. When director Pavel Parkhomenko and producer Oleg Kapanets said, “You really do look like him,” I thought they were kidding. If they’d have used latex or something similar to make me look like Gagarin, then the resemblance wouldn’t have bothered me. But the screenwriter, director and producer had a different task: It was not their intention to create a mask or a “dummy”; it was all about the energy exuded by the hero. Izvestia: How did you prepare for the film? Y.Z. : I started working out with a personal trainer before we started shooting. It was like I was training to be a real cosmonaut; apart the parachute jumps, I did all the stunts myself. I wanted to try everything — for example, the centrifuge. In the centrifuge, Gagarin was exposed to a force of 10g. I was only allowed to experience 4g: That’s all a person with my body type and physique can handle. It’s definitely not for the faint-hearted. Izvestia: What did you take from the role personally? Y.Z. : For me — like for everyone — Gagarin is a hero. When I was working on the film, I realized that he was just an ordinary man who had the same opportunities as each of the 20 airmen who formed the first cosmonaut unit. He had a great sense of purpose and was bent on achievement. This is what I liked about him most of all. I’d like to bring out the same features in myself. Izvestia: Did you get along with everyone on set? Y.Z. : In the film, Gagarin is played by four actors. I play him from the age of 17 to 27, and Gagarin was 27 when he made his flight. True, I was a bit younger when the shooting took place. I got along really well with Nadezhda Markina, who played Gagarin’s mother. She was so immersed in our scenes that, at times, I felt she was thinking more about me than about herself. When they shot close-ups of me, I felt and saw from her facial expressions that she was playing along with me. It’s such a pleasure to work with such an actor. I also became good friends with Mikhail Filippov, who played the engineer Korolyov. He has this kind of energy: He doesn’t show his emotions very much, but he has an entrancing voice, unusual eyes and expressive body language, and that spurs you on. In short, I was lucky to work with such great professionals, and I hope that I did a good job. First published in Russian in Izvestia newspaper.